French boutique retailer Colette has launched an online sale offering many stainless steel Apple Watch and 18-karat gold Apple Watch Edition models for around 50% off, by far the lowest prices available for those Apple Watch models this Black Friday and Cyber Monday. Due to the significant savings, stock will likely be depleted very quickly. A total of thirteen Apple Watch and six Apple Watch Edition models have been listed for half price, although some models appear to have already sold out. Colette is also selling individual stainless steel Link Bracelets and Milanese Loops for half price during the limited time promotion. The list below compares Apple's regular price to Colette's sale price for each Apple Watch model. All prices are listed in U.S. dollars. Colette offers online checkout for in-stock Apple Watch models and accessories, with American Express, MasterCard, Visa and PayPal listed as accepted payment methods. Each Apple Watch may only be purchased once. Best Buy and Target are also offering Apple Watch deals for select models on Black Friday, including the Apple Watch Sport, which is not on sale through Colette. Deals may vary depending on time, location and product availability. Update: As expected, Colette has sold out of stainless steel Apple Watch models, while Apple Watch Edition models remain available for purchase. Sort of signifies the lack of demand for the watch. Black Friday deals tend to be for things that people actually want. It defeats the purpose of getting people in the door / to the website if it's something nobody cares about. Hey, did you know Ballmer's best year was the year before Microsoft sales plummeted? To see if someone is going to "kill it", you need to look at their new products and the direction they are going, not the past. I disagree. The MacBook is actually pretty useful and will only get more so as Intel gets its act together with Core M. Given Intel's pricing for Core M the MacBook is fairly priced. iPad Pro seems to be enjoying a burst of popularity and may convince more developers to see the iPad as a "real" platform. Tim Cook has done a decent job as CEO. People like Steve Jobs come around once in a lifetime. Following is a difficult act. Cook has done a far better job than Steve Ballmer. Unlike Ballmer, Cook didn't inherit virtual monopoly cash cows in Windows and Office. Arguably Steve Jobs cost Apple by not developing iOS with resolution independence. It cost Apple at least one and probably two years before the iPhone 6 Plus was ready. Google Now "kills" Siri because Google has no scruples and mines everyone's personal data. I like Apple's stance on privacy. As for hardware, have you seen the benchmarks for the A9? The best CPU engineers want to work for Apple now. Hmm... cut 9000 dollars off the price and still make a profit? Interesting. I didn't realize that all Black Friday deals were profit makers.... weird. Ok- I'm going to be busy Googling "loss leaders" for a while. Just call me if you need anything, k? So I'm naive for assuming a Jewelry Store is making a profit. And you are savvy cause you learned about loss leaders in 10th grade. Got it. Clean up in aisle 7. I know but Apple products tend to have very modest sales because they sell without them. What does that really matter as long as people are getting a great deal, and 50% off IS a great deal. Oh I know, I'm commenting on the lack of demand for the product requiring such a sale, not the sale itself. A gold plated glorified "step counter" should be hitting the top ten lists of "2015 dumbest product releases" pretty soon, at least dumb from the 99%ers POV, but I think even rich people think the gold Apple Watch Edition is a joke. If there was a market for gold plated digital watches Timex and Casio would have owned it 30 years ago, but even a gold plated calculator watch would be functional today, a gold Apple Watch will be 'pretty useless' in a year or so, especially when 2.0 comes out. what on earth are you talking about? theres nothing gold-plated about the Edition. and the watch won't be useless, it will continue to do exactly what it did from day 1. which is much more than any mechanical watch. Lost leader or are they trying to move inventory that just isn't selling. Just go to an apple store and see how many people are looking at the apple watch.... And if it is no one.. then you will start believing that is a reason why Apple hasn't released sales numbers. 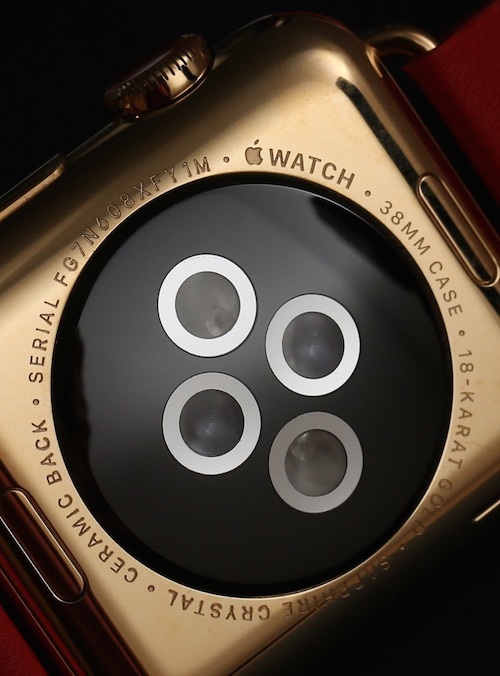 Apple watch is the best smart watch on the market, but the price is wrong. 50% off is more realistic for it's features. Once the board of directors sees how bad Tim screwed up, he will be forced to make some changes. Too bad they won't get ride of him though! complete nonsense on your part, of course. apple said from the very beginning they wouldnt release sales numbers for competitive reasons (you know, just like Samsung and Amazon dont -- do you think theyre failing, too?). but analysts have studied the "Other" category and surmised by the billions of new profit there that the number was quite large. My Colette order has shipped! SS 42mm black sport band.